What do Jeremy Corbyn, Miley Cyrus, David Haye and Ellie Goulding have in common? They’re all vegan. With the popularity of vegan diets on the rise, partly due to the media attention plant-based diets are gaining due to the increasing number of celebrity vegans, it may be helpful to remind people that hair loss can become an issue when certain foods or nutrients are not present. Of course veganism is not a guaranteed fast track to baldness. However, when dairy products, eggs, meats and fish are suddenly removed from the diet – as with any significant shift in diet – it is certainly possible that this can adversely affect the hair. According to new Mintel research, 11 per cent of the world’s vegan food-based start-ups in 2016 were based in the UK, and in Germany the figure was 18 per cent. Clearly, veganism in Europe is as popular as ever. Opinions on whether a meat and dairy free diet is as good for individuals as it is the animals they hope to protect is divided, but what a sudden change in diet can do is kick-start a hair loss condition named Telogen Effluvium, which leads to an all-over thinning across the head. The shedding it causes can be extremely alarming when first noticed, and while thinning is usually not as dramatic as that seen when people have the autoimmune disorder Alopecia Areata, for example, it is nonetheless worrisome, as people don’t understand what is happening. Treatment for Telogen Effluvium at Belgravia will typically start with an assessment of the causes of the hair thinning, and as well as recommending tailored solutions based around the topical hair loss drug high strength minoxidil. Clients will also be advised about non-pharmaceutical hair growth boosters and lifestyle approaches to consider, which may include trying to replace the minerals and nutrients that have suddenly stopped being supplied to the body with those that come from meat-free alternatives. Telogen Effluvium can occur due to a lack of amino acids, something quite commonly seen when people turn to a vegan diet if they aren’t careful to replace them with a suitable source. These acids are essential for the production of keratin, among other things, and given that keratin accounts for almost 90 per cent of what your hair is made of, it is obvious that replacement sources need to be sought out. 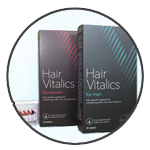 Vegetarians who feel that they are not getting enough from their diet alone can top up by taking a targeted hair growth supplement such as Belgravia’s exclusive Hair Vitalics products, though these are not suitable for strict vegans. This is because the Vitamin D3 that they contain, whilst being responisbly and sustainably sourced, is derived from lanolin which was taken from the wool of healthy, live sheep. As there are various levels of veganism, including people who follow a ‘vegan diet’ in the sense that it does not contain animal flesh, eggs or dairy products but do not follow a vegan lifestyle (still wearing wool or silk, for example), some vegans may feel comfortable with this. Fortunately, for those who don’t, amino acids can also come from certain vegan-friendly foods, with good supplies being found in lentils, sprouts, tomatoes and leafy greens. While Telogen Effluvium is more common in women and men, both sexes can be affected, and likewise they are both susceptible to the condition either speeding up or initiating genetic thinning if they are already genetically-predisposed to hair loss. Not everyone is earmarked for male pattern baldness or female pattern hair loss, but those that are may find that Telogen Effluvium starts the clock a little earlier than they would have liked. If you have inherited an active predisposition to genetic hair loss then there is no avoiding this without intervention. Pattern hair loss treatment for men and women is well-proven and can help to stabilise shedding, promote regrowth and prevent baldness through on-going use. It may also be a good idea to adopt a proactive approach to making sure a switch to a vegan diet is as undemanding on the body as possible. In this way, Telogen Effluvium may be avoided and with it any early onset or unnecessary acceleration of male pattern baldness or female pattern hair loss. The Mintel report states that processed “meat substitutes” appear to be losing popularity, with vegans and vegetarians looking for natural alternatives instead. Given that processed foods with artificial additives and sugars are so often linked to obesity and Type 2 diabetes, this can only be a good thing. The strain placed on the body by both of these health conditions is known to be another cause of thinning hair as these too can lead to Telogen Effluvium. In fact, a report in 2016 noted that plant-based diets were associated with lower risks of obesity, certain cancers and heart-disease. The secret to a successful vegan diet, said the experts, was to ensure that it was healthy and balanced. Does Iron Deficiency Cause Hair Loss?